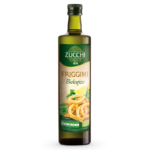 Soft and irresistible, for frying to perfection with Zucchi Organic Deep Frying Oil, so you can enjoy them without feeling guilty. Here are our Carnival Tortelli, ideal for an afternoon of confetti and fun! Place the water, milk, sugar and lemon rind in a small saucepan. 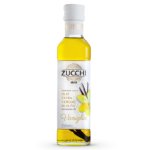 Pour in two small glasses of Zucchi Vanilla-Flavoured EVO Oil then mix thoroughly and bring to the boil. When the mixture starts to boil, take it off the heat and remove the lemon rind. Then add all the flour together with the baking powder, return to a low heat and stir briskly with a wooden spoon. Transfer the mixture to a pottery bowl and leave to cool for a few minutes. Then add the eggs one at a time - taking care to mix each one in thoroughly before adding the next one - and a spoonful of rum, to obtain a smooth, lump-free mixture. Heat the Zucchi Organic Deep Frying Oil in a large frying-pan and wait for it to heat to the correct temperature. Then take a spoonful of the mixture and drop it into the hot oil. Cook until a uniform golden brown (no more than 3-4 spoonfuls in the frying-pan at a time). Drain the tortelli on kitchen roll and dust with sugar before serving if liked. The recipes suggested by Zucchi promote the culture of oil, a real art which expresses all the values of Italian quality and passion.